Quickly blanch green beans in boiling water for just a few minutes, until bright green. Drain, and ollow up with a quick ice bath. Drain again. Use [these tips] for tips on blanching if it's your first time using the technique. It's beyond easy! Dice your veggies, puree your dressing in a blender or food processor, and combine! Isn't that why we love salads? They're beyond easy. If you prefer extra-crunchy raw green beans to blanched, go for it! I find that blanching and then chilling them in an ice bath gives them the absolute perfect blend of crispness and tenderness. I do the same for my asparagus and many of my broccoli dishes too, I'm a blanch-a-holic! 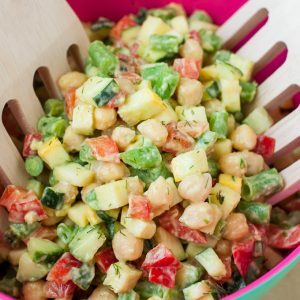 This tasty recipe yields approx 6 cups of salad and serves 6 or more! Nutrition facts and values below are estimated using an online recipe nutrition calculator for both the dressing and the salad. Results may vary slighlty.